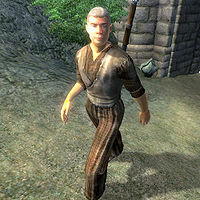 Carsten is a Nord warrior who is boarding at the Two Sisters Lodge in Skingrad. He and his colleagues Eridor, Shamar and Vontus Idolus have come to town to investigate rumors that Skingrad has been infiltrated by vampires. He only appears at the start of the Information at a Price quest. He sleeps upstairs in the Lodge from 11pm until 6am and then walks to his assigned guard point - just outside the eastern gate, on the other side of the bridge. At 1pm he returns to the Lodge to eat lunch until 4pm and then goes back to patrolling the bridge until it's time to head to bed again. This behavior changes if the vampire hunters are tipped off about Bloodcrust Cavern. At midnight on the next day, Carsten and the others will head there and attack the inhabitants. Carsten is stubbornly uncommunicative and will only say: "Eridor says I ain't supposed to chat with people in town. Sorry." Vampire hunting is evidently not providing much wealth for Carsten. He wields a steel warhammer but can only afford a lower-class outfit of coarse linens, a coarse linen shirt and a pair of oiled linen shoes. He also carries a few gold coins. Information at a Price: Travel to Skingrad to receive information from Count Hassildor... at a price. A few additional comments were recorded for Carsten, but due to him always closing conversation, they never appear in the game: "Sorry, just doing my job. ", "Uhh, hello." and "Leave me alone. I'm busy." If the vampire hunters are persuaded to leave town, they actually hang around indefinitely. Carsten will keep following his usual routine. This bug is fixed by version 3.5.2 of the Unofficial Oblivion Patch. This page was last modified on 25 December 2017, at 19:19.